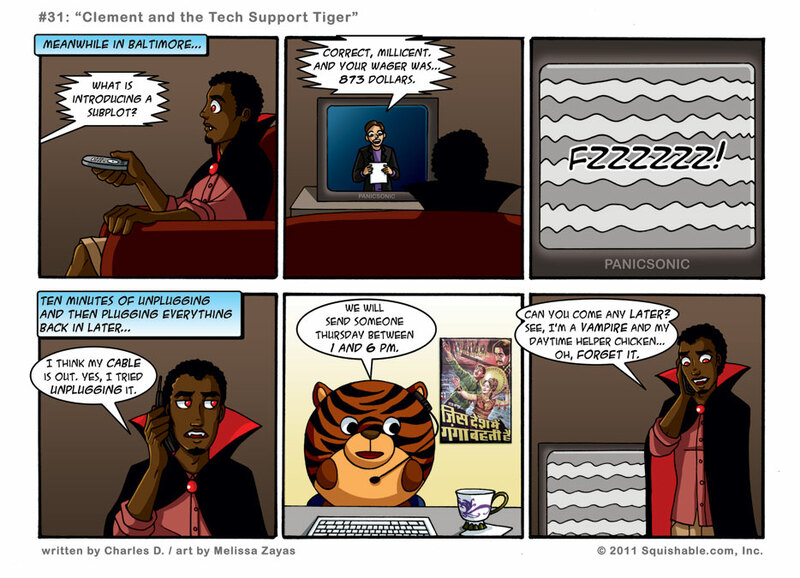 Don’t forget the Fuzzy Five’s First Fan Funtest… win a free Squishable! I got myself the greatest gift of all for Christmas … a DVR. My non-vampiric readers may not realize this, but haunting the night with an insatiable thirst for blood means no daytime TV. If you can believe it, I got my first TV in 1960 and have never seen the Today show! I had a VCR in the ’80s, learned to program it in the ’90s and briefly got hooked on General Hospital before it got stolen. Because I live in a dump. Ugh. Speaking of which, I also signed up for HBO and have been catching up on True Blood. How do TV vamps live in these huge houses while I’m on the third floor of a walk-up rowhouse overlooking a heroin bazaar? It’s not like they have day jobs. Plus, it looks like they spend a lot of money on clothes. Back around 1915, another vampire told me that if you sock away a little money every year, the power of compound interest will make any chump change into a trust fund after a few centuries. I can’t take a job that requires me to be up before sunset (I’m probably the only person have washed the dishes of both H.L. Menken and D.L. Hughley), which means that a century of scrimping and saving gives me just enough extra money to get a DVR to plug into my water-stained, lead-painted and entirely too thin wall. A lot of vampires make good money driving taxis, but I’ve been three weeks away from turning old enough to get a hack license since cars were hand-cranked. Maybe by 2050, I can move to a place where drinking the local blood doesn’t get you high if you forget to look for track marks. But broke as I may be, the DVR is worth it. Nighttime TV is all violence, dirty jokes and ads for chat lines. During the day, TV shows a more even-tempered side. Have any of you heard of CBS Sunday Morning? It’s so … calm. Last week, they had segments on cookies that look like people, “interesting seashells” and a bittersweet piece on the most famous trees to fall during 2010. For a guy whose morning programming is To Catch a Predator, it’s a welcome change. And why didn’t anyone tell me about The View? That Joy Behar is a crack-up! Clement should be a little more rattled by this. After all, it’s a Panicsonic. Ooooh, do all Squishables come guaranteed to be gainfully-employable? Then I could go to part time and have more time to hug the Squishable! (And after working phone tech support, the poor guy is gonna need a lot of hugs! hey teen vampire, how about playing the stock market? if you like in North America, you can probably play with the Asian stock market when its daytime on their side of their planet…just sayin’. then maybe you can get a nice place. and watch all the cable you want!